Police officers are hunting thieves who used a forklift truck to smash their way into commercial premises in Maghera before making off with a number of power tools. The break-in occurred at the MFL Plant Machinery unit in Sperrin View Business Park in the early hours of Tuesday, March 13. A PSNI spokesperson said: “At some point between 3am and 4am a forklift was driven through the front doors of the premises and a number of Milwaukee power tools were stolen. 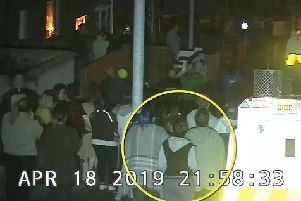 Appealing for witnesses to come forward, the spokesperson added: “The business is located opposite the filling station at the bottom of the Glenshane Pass and we know from CCTV a number of vehicles passed during the burglary. Were you one of those driving on the A6 Glenshane or the Glen Road around 4am on the 13th? Did you see any other vehicles pass you? Notice anyone out walking?